Jin Jiang International (Holdings) Co., Ltd.
Jin Jiang International (Holdings) Co., Ltd. (“Jin Jiang International”) is one of the leading travel and hospitality conglomerates in China . It has 2 billion yuan of registered capital and approximately 50,000 staff. Jin Jiang International has three core businesses: hotel management and investment, tourist services and transport and logistics. It holds directly/indirectly four listed corporations: “Jin Jiang Hotels” (2006 HK), “Jin Jiang Development” (A share 600754, B share 900934), “Jin Jiang Investment” (A share 600650, B share 900914) and “Jin Jiang Travel” (B share900929). 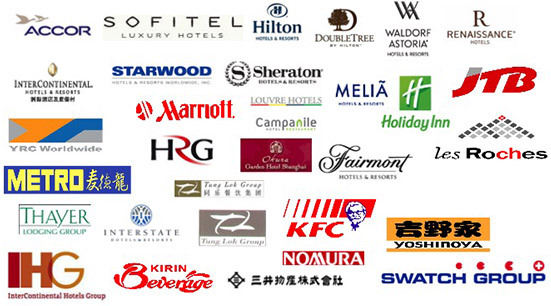 Jin Jiang International has extensive business and equity partnership with prestigious hotel groups such as Marriott, Hilton, InterContinental, Fairmont Raffels, Accor as well as over two dozens of globally renowned corporations such as Japanese Mitsui, JTB, US Yellow Roadway, UK HRG, Swiss Les Roches Hotel Management College. 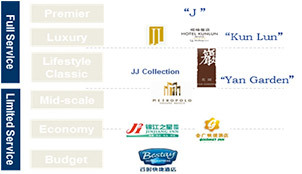 ”Jin Jiang” is a famous brand in China at value of 17.2 billion yuan. As a leading player in the travel and hospitality sector, Jin Jiang International is known for its reliability and creativity. The logo is inspired by Chinese calligraphy that interprets the aspiration for cultural exchange and fusion between the East and West. Letter C refers to China. The swirling oval shape implies enormous space and power of the Universe. Letter J refers to Jin Jiang. Inserted in the letter C , it represents the dedicated Jin Jiang team which is committed to creating better life for guests and clients. The Jin Jiang Blue symbolizes innovation, wisdom, elegance and consistent aspiration for growth and excellence. 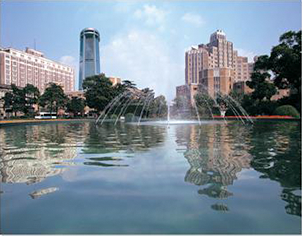 With a full-spectrum brand portfolio, Jin Jiang Hotels owns, operates and manages 1,566 hotels with 235,500 rooms. Among which, 382 hotels in 10 countries of North America, Europe and Asia are managed by Interstate Hotels and Resorts which is 50% owned by Jin Jiang International. Jin Jiang International Holdings ranks 10th by HOTELS. The Sino-Swiss Les Roches Jin Jiang International Hotel Management College is established for the training of senior executives and operational staff. Through parternship with KFC, Yoshinoya and other brand owners, it runs 480 Chinese and western-styled chained outlets and restaurants with an aim at developing centralized food service, group catering, and semi-finished food products. Owning a fleet of over 10,000 passenger vehicles, Jin Jiang Transport provides quality transportation solutions to political VIPs, business travelers and tourists. Jin Jiang Auto Services Center is committed to developing an auto value chain covering repairing, leasing, training and sales. JVs with Yellow Roadway and Mitsubishi are involved in freight forwarding and cold-chain logistics. Jin Jiang Logistics boasts the largest cold storage capacity of 500,000m2 in Shanghai and aims to transform itself into a modern cold-chain logistic provider. As the third largest travel operator in China, Jin Jing Travel provides travel services,planning and consulting for individual tourists and MICE clients through 67 subsidiaries of China International Travel Service (CITS) , Shanghai Jin Jiang Tours, Shanghai Travel and Huating Overseas Travel, etc. Jin Jiang International Hotels Development Co., Ltd.
add: 3F No.51 Guangdong Rd. Jin Jiang International Industrial Investment Co.,Ltd. Jin Jiang International Travel Co., Ltd.